If you have a tooth that is damaged or badly decayed, Dr. Arash Azarbal can beautifully and conservatively restore it with a porcelain inlay or onlay in just one appointment. As an extensively trained cosmetic dentist, he utilizes the most advanced techniques and highest-quality materials available to provide an exceptional result. What Is a Porcelain Onlay? This is a cosmetic dental treatment that uses custom-fitted porcelain to restore your tooth. While an inlay is placed inside your tooth similarly to a filling, the onlay covers at least one chewing cusp—the pointed part of the chewing surface of your tooth. What Is a Porcelain Inlay? 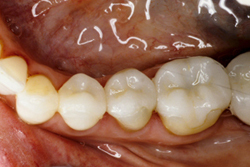 It’s a custom-fitted porcelain restoration that is bonded to your tooth. Although an inlay is placed in your tooth similarly to a filling, it is stronger than a white composite filling, which is made of glass or quartz that is mixed with plastic resin. After your tooth is numbed, Dr. Azarbal will remove any decay or old filling material and as little of the tooth structure as necessary. He will clean the tooth and prepare it for an inlay or onlay. Dr. Azarbal will use CAD-CAM (computer-aided design/computer-aided manufacturing) technology to take a digital impression of your tooth. The virtual model of your prepared tooth will be used to design and make the inlay or onlay. A CEREC® milling machine will use the virtual model to craft the restoration from a small block of porcelain. In about five minutes, your inlay or onlay will be ready. Dr. Azarbal will place it on your tooth for fit. When the fit is correct and no adjustments need to be made, he will clean and dry your tooth, and bond the restoration onto it. 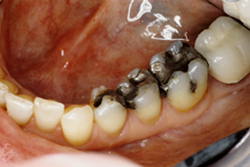 The photos below are an example of old amalgam fillings that were replaced with natural-looking porcelain onlays. It conservatively restores a tooth without the use of a porcelain crown. Less of your tooth structure needs to be removed, and it won’t irritate your gums, as a dental crown may. An in-office CEREC® inlay or onlay is completed in one visit, while other methods require two visits. It is very stable and will strengthen your tooth. It seals your tooth and will keep bacteria out. It will blend in with your tooth and look very natural. If you would like to know if this treatment is right for you, call us to schedule an appointment, or request an appointment online.